As a kid, Karthick had fascination and obsession towards the humble pot instrument, which brought the great fortune. With the tutelage of Gurus of this caliber, a firm foundation was laid for an illustrious music career. As one of the most preferred artiste, Ghatam Karthick has accompanied almost all top-ranking artistes in the Carnatic music front. 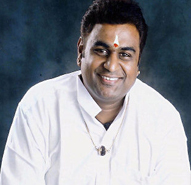 Graded 'A' in All India Radio, Chennai, Ghatam Karthick has also been part of National Sangeeth Sammelans, National Programs of Music, South Zone Hook-ups, Invited audience concerts both in All India Radio & Doordarshan. Karthick has also performed with varied artistes in numerous Cassette and CD recordings and Private Channels. Karthick has traveled all over the world with his wonder pot performing in various prestigious venues including the ‘United Nations’. Karthick leads the percussion based Indian musical ensemble “heArtbeat” that has been highly acclaimed by press and public. Karthick also records and performs prolifically in settings as varied as traditional Indian classical music, jazz, rock, blues, flamenco and fusion. Karthick has given articulate lecture-demonstrations and workshops at various institutions in India & abroad. Karthick has been a part of many fusion ensembles collaborating with international artistes and features frequently as one of the most in-demand percussionists in the Indian film industry for top film composers like Ilayaraja, A.R.Rahman, Harris Jayaraj, Bharardwaj, Vidyasagar and also for Tele-Serials. He also involves in many humanitarian activities like blood donations and supports philanthropic organizations. All these facets have earned a special place in the hearts of rasikas. Karthick's father was a visionary in the sense that he was far ahead of his times and predicted things for Karthick and what ever Karthick is today is all because of his father Late Sri. E.V.Subramaniam, who believed strongly that his son, would become a virtuoso performer. He encouraged Karthick in each and every move. Affectionately called 'EVS Mama' was a pleasing personality to all Karthick's friends and was admired by all. He continues to bless Karthick from Heaven. Karthick's mother, Smt. Padma is a good vocalist, She has given vocal concerts, also sings for dance recitals frequently, apart from training students at home. She enhances his compositions by her deft changes. She is the source for Karthick’s Sangeetha Gnanam. Karthick is also very active in humanitarian activities such as blood donations. He has donated 30 times till September 2005. He has also pledged his eyes after his death with Sankara Nethralaya. Karthick also lends his support for philanthropic organizations like Spastic Society of India, Lions Club, Rotary club etc. Karthick participates in benefit concerts for Earthquake victims, Kargil Soldiers, Flood relief, Cancer cure, Fund raising concerts for School Building fund etc. Karthick relishes watching TV just happily, as his best relaxation. Enjoys his ride, on Chennai roads, in his favorite Kinetic Honda. He enjoys watching MGR films and Mythological Telugu movies and listens to MKT, TMS, SPB and C.S.Jayaraman songs. Karthick is a Great fan of GNB, Balamurali, S.Kalyanaraman and Ilayaraja’s music and feels happy to listen to Phil Collins & Sinead O Connor. Karthick is also an amateur actor, humorist, lyricist and painter. He has acted in TV dramas in school days, as Emperor Akbar in an opera conducted by Smt.Charumathi Ramachandran and has actively involved himself in the ‘Samskrita Ranga' participating in the Sanskrit dramas. His sense of humour, enthusiastic participation and witty answers won him great admiration in the TV shows like Nayyandi Durbar, Ari-Giri Assembly etc. He has also been a Guest Speaker in the Humour Club International. Karthick has also modeled for an advertisement for RPG Mobile Phone. His parents Sri. E. V. S & Smt.Padma Subramaniam. wife Anjana, son K.Sarvesh is doing his UKG in Padma Seshadri Balabhavan Senior Secondary School, K.K. Nagar. He learns mridhangam from Poongulam Sri.Subramanian and is an avid participant in all school cultural events. Karthick's one-year-old little daughter is K.Sravishta; just born on August 10th, 2004 smiles big at her proud father, to convey him further fortune. As of now, Sravishta seems to be a potential artiste dancing to Superstar Rajnikanth’s hit-songs. Brought up under the guidance of Ghatam Maestro Shri.’Vikku’ T.H. Vinayakram and Legendary Genius Shri. T.H. Subash Chandran. Ghatam Karthick is a proud student of the famous “ Red Building ” Hindu Higher Secondary School, Triplicane, Chennai-5. Ghatam Karthick holds an M.A. and M. Phil Degree in Sanskrit, and has submitted his PhD thesis guided by Dr. S. Ramaratnam, former Principal and Head of the department of Sanskrit, Ramakrishna Mission Vivekananda College, Mylapore, Cheanni-4. Ghatam Karthick secured University Second Rank in both B.A. and M.A. His topic for dissertation in M. Phil 'Percussion Instruments in Sanskrit Literature' was certified as highly commended. Ghatam Karthick has regularly contributed articles to journals, websites, seminars, souvenirs & presented papers in prestigious seminars and symposiums. Currently, he is pursuing his M.A. in Indian Music Department in the University of Madras. Title of “YUVA KALA BHARATHI “from Bharat Kalachar, Chennai. Title of “NAADA OLI “from Nada Inbam, Chennai. UMAYALPURAM KOTHANDARAMA IYER AWARD, Sri Ragam fine arts. FELLOWSHIP from Department of Culture, Government of India. AWARD FOR EXCELLENCE from Maharajapuram Sri Viswanatha Iyer Trust. AWARDED BEST GHATAM ARTISTE from Indian Fine Arts Society. AWARDED BEST GHATAM ARTISTE Prize from Sri Krishna Gana Sabha. AWARD OF EXCELLENCE from Shanthi Arts Foundation (SAFE), Chennai. UPA PAKKA VADYAM AWARD from Sri Narada Gana Sabha.